Shin Hokuto no Ken is a 3 episode original video animation series, with the first episode originally being released in Japan in July 2003. The series is an adaption of Jubaku no Machi (The Cursed City), which was a novel written by Buronson and Tetsuo Hara in 1996. 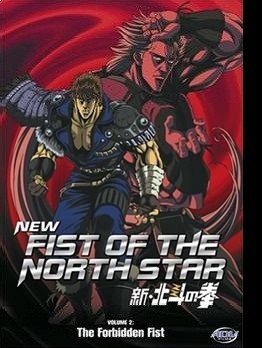 The story is set an unspecified amount of time after the events of Hokuto no Ken 2. 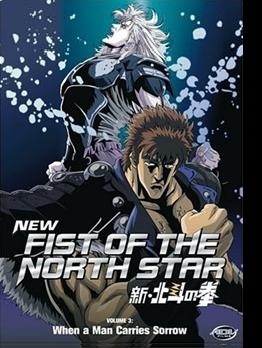 Outside of Japan, this series is known as New Fist of the North Star. "Kenshiro is in fine form, and though the story may not blow you away, it’s plenty adequate to support the action"
"Flashy and a little cheap, but ultimately rewarding." Complaints about the series include the animation -which blended together traditional 2D cell animation along with computer generated imagery. Actual characters are rarely CGI, but things like bikes and some buildings are, and there are several pointless CGI shots, such as Sanga running down a corridor, which feel unnecessary. 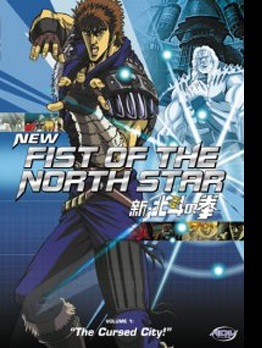 Fans have a particular hatred for a scene in the third episode, where Kenshiro cannot break down a simple metal gate, despite the powers he has. The series has so far seen several DVD releases across the world. 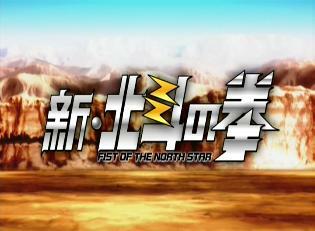 ADV Films released the series in both America and the UK, featuring a new English dub or the original Japanese audio, along with some extra features such as cast interviews and commentaries. Each episode has seen a separate DVD release, but there is also a "Complete Collection" option which has all three episodes in one three disc set.